Loving the event, more pvp is always great. I still can't believe it was pulled off so smoothly with limited downtime. Thank you very much the team put a lot of effort into this event to give some life and reason to PVP and go to Halsa, all for the communities enjoyment. its recycled cr. Edit: that sounded extremely ungrateful, it is cr basically but yes its cool that the devs are willing to do stuff like this just the community asked for it. Yes PvP is always great but 0 Nuians and 0 Pirates. Dead event, you need to change something (PvP Quest 1000 honor + sealstones, nerf mobs and bosses, ...). Or rework completely the event : remove rift and make perma mobs like old hasla. I honestly haven't gone back to Hasla to do the event since the first two rifts on the first day it was released. It needs a lot of tweaking in order to be worth it. 1. Now instead of 8 rifts quantity is changed to 3. - 1 rift (7 pm) is an easier one for new players. It includes weak mobs and only 1 boss at the end. Stranger's Sealstones these mobs drop will help players to craft Hasla weapon very easy. Other types of Sealstones will not drop from this rift monsters. - 2 other rifts (9 pm) are for old players. They start simultaneously. Mobs are weaker than previously. They drop Evil, Bloody, Venom and Dark Sealstones. Significantly increased the quantity of dropped from monsters Sealstones. 2. Time of event (one rift) is reduced from 1 hour to 30 mins. 3. Separate craft Workbench with weapon for Strangers (new players) is added. Any chance of having a map of potential spawn locations? after 1st phase is cleared it will spawn the same mobs from before the rework, elite soldiers and mages that hit for a fuckton and ofc spawn all stacked up, again i'm not sure who tested this but imo this is really stupid unbalanced considering this is the "newbie" rift. Also when second phase starts the timer gets fucked up and delay the end of the rift. Again it seems like it was balanced around a small raid of people doing it or 2-3 players already geared which again makes no sense since they have 0 reason to come and help. @ichizu The event is currently being monitored and will continue to be monitored while it receives tweaking. 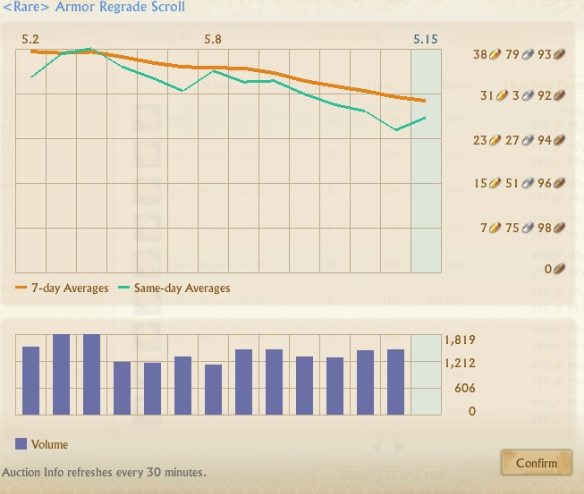 after putting some time into farming these scrolls i feel like the negative effects they have on other sources of regrade scrolls is far too high. the quantity of scrolls you can make in very small amounts of labor from clearing a rift far exceeds the effort, labor and time investment via farming in auroria. this effectively bypasses 6 different sources of income for players on the server. also, at current market prices there's no reason to craft the lucky scrolls as the normal scrolls yield much more profit than crafting the resplendent, and require much less effort to craft than the unbound resplendents. i believe that at a very minimum the labor cost as well as the materials required should be increased so that logs in auroria remain a viable way to generate income. 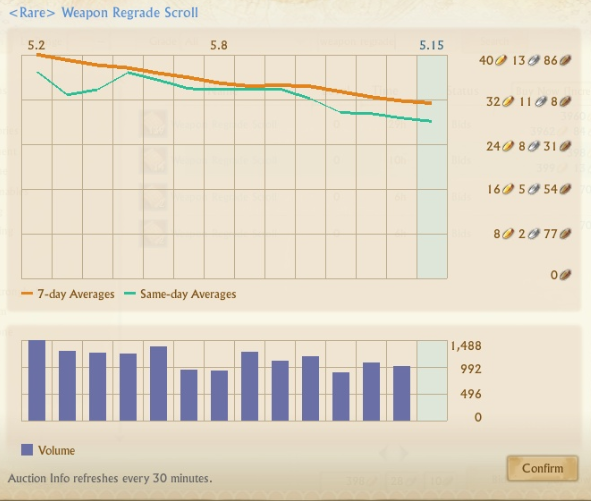 if you'd like i can post the data i have collected on the number of regrade scrolls we were able to obtain by clearing both rifts over the course of 3 days. also, at current market prices there's no reason to craft the lucky scrolls as the normal scrolls yield much more profit than crafting the resplendent, and require much less effort to craft than the unbound resplendents. increasing the cost to maybe 5-8 stones to craft armor & weapon and 4-6 to craft accessory. i believe that at a very minimum the labor cost as well as the materials required should be increased so that logs in auroria remain a viable way to generating income. @illusia Did you encounter interference from other players, or was this solely from being able to farm without other players causing disruption? Event is 30 mins long only. Scrolls are not the only items that Sealstones can be exchanged to so no sense to convert stones you can get from the event to scrolls only. Event was made for the bigger quantity of players to attend than just 4-8. More players attend the event less stones will go one hands. Players asked for more ways to obtain some of the items in game. This option was provided to players. Again, its a limited time event with limited number of resorces you can receive from it. Other activities in game, like fishing, Auroria and so on are not limited in time daily, so it's wrong to compare them. In case event is not popular and turns in just a few players free farm, it will be removed. also, the event isn't 30 minutes long, each wave lasts 30 minutes. if you don't kill the first wave within 30 minutes, the rift will despawn BUT if you kill the first wave in 29 minutes and 59 seconds, the second wave spawns and gives you another 30 minutes to finish it. it's exactly the same as the mechanic CR uses.